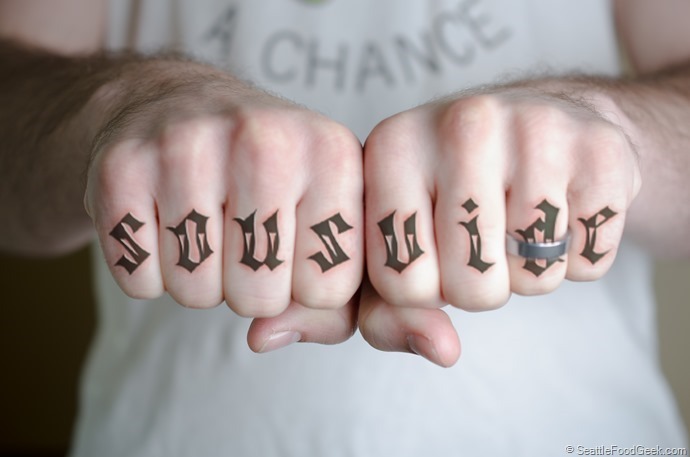 It’s been a long time coming, but I finally got “sous vide” tattooed across my knuckles! This might turn out to be a career limiting move, in hindsight, but I’ve been so passionate about sous vide cooking that it’s become a part of who I am. I’ve already got the geek glasses on my right forearm, and I’m thinking of doing a time and temperature table on my left forearm next. Update: April Fools! No ink on my hands… yet. Photoshop FTW.